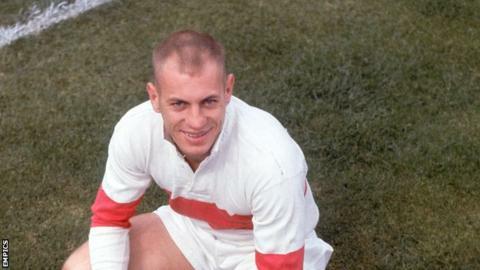 Tom van Vollenhoven scored a hat-trick of tries against Wigan in his final game at Knowsley Road before retirementSt Helens legend and former South Africa rugby union winger Tom van Vollenhoven has died at the age of 82. The 'flying Springbok' scored 392 tries in 408 appearances for Saints after signing for the club in 1957. Before switching codes, Van Vollenhoven played union for Northern Transvaal and scored a hat-trick of tries against the Lions on their 1955 tour. "Everyone at the Saints sends their deepest sympathies to the Vollenhoven family," a club statement said. Van Vollenhoven, then 22, scored on his Saints debut against Leeds at Knowsley Road after signing for the club for a fee of £7,230 - a record figure at the time. In his first four seasons with Saints, he helped them win the Lancashire Cup, League Championship and Challenge Cup. He eventually retired in 1968 after guesting for Great Britain in a World Cup trial match. "Everyone at the club and in the town of St Helens would like to express our sincere condolences to Tom's wife Leone and to his family," chairman Eamonn McManus said. "The name of St Helens will always be much the richer because of the decade during which Tom wore our shirt with unparalleled success, pride and distinction."